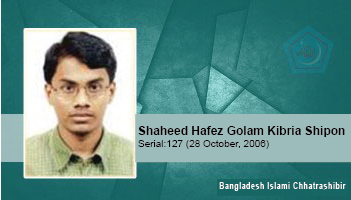 Golam Kibira Shipon was a first year student of BSc in Physics in Dhaka College. He was a very brilliant student and a Hafez i.e. one who memorized the Holy Quran by heart. He had achieved distinction in his Higher secondary exam. Shipon was the president of 27 ward branch of Bangladesh Islami Chhatra Shibir, Dhaka south unit. He was brutally killed in similar fashion as Mujahidul Islam. Place of martyrdom: Baitul Mukarram. He was injured in Awami League led 14-party attacks on the Northern gate of Baitul Mokarram and he attained martyred at Islami Bank Hospital.